Physicians in this country, besides deploring the way most Americans eat, often extol the benefits of the so-called “Mediterranean diet.” We could all probably cite certain elements of this heart-healthy fare such as olive oil, fruits, vegetables, small amounts of meat, and so on. But, one might ask, what specific countries does it center on? One article I found recently suggests Italy, Spain, France, Morocco, Greece, Lebanon, Syria, Turkey, and Israel as sources for this type of cooking, so woohoo ! I believe we could all live with cuisine from those areas without feeling deprived. Hummus, pita bread, grape leaves, paella, and Greek salad, for example, would add up to a pretty tasty meal. 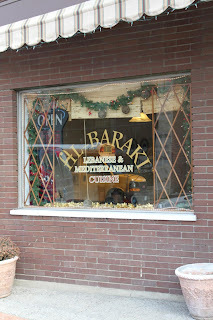 Last night we visited a pleasant medium-sized, Lebanese restaurant on Remsen Street in Cohoes called Al-Baraki. Originally situated on River Street across the Hudson in Troy, this family-run establishment is the total package: good service and good food at reasonable prices. The friendly staff from waitress, daughter Maya right up to chef Paul and his wife, all seem to want to make sure that you’re enjoying your meal. We had eaten at their Troy restaurant a couple of times and noticed the new location while on a walk through downtown Cohoes in November. Finally, we remembered to try out their new place this weekend. 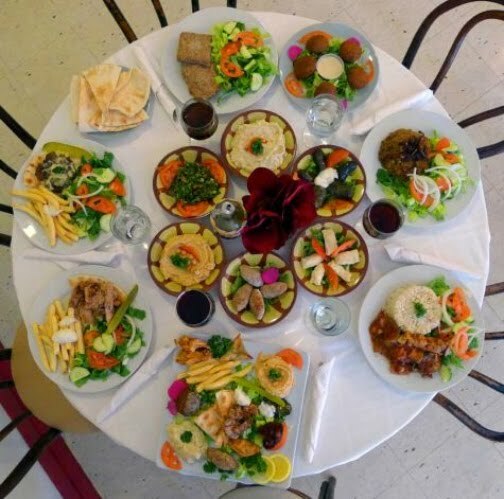 After perusing the menu, we started out sharing their mezza sampler, a combination of hummus, baba ghannouj, a grape leaf with their own yummy garlic dressing, two falafel, tabouli, and some pickled radish. It was all very fresh tasting. 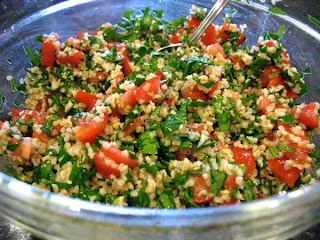 I especially appreciated the tabouli—the best I’ve ever had, full of fresh herbs and lemon. For my main dish I took Maya’s suggestion about their oven pies. Although it was hard to pass on the one with goat cheese and mozzarella, I selected the lower-cal, lower-cholesterol spinach version. I was not at all disappointed in the small crusty pizza and highly recommend it. In fact, this total vegetarian meal did not leave me, the ultimate carnivore, wanting for meat at all. Now I really want a Lebanese cookbook! Our only splurge, calorie-wise, was the homemade baklawa for dessert, a version of what most of us consider the Greek classic which has the same combo of nuts, cinnamon, and phyllo dough. All in all, this experience has taught me that there is a way to find and cook very healthy, delicious meals without going vegan—not that there’s anything wrong with that, if you're into it. Mediterranean cuisine does exactly what doctors and author Michael Pollan recommend: treat meat as a side; eat real food, not too much, mostly plants; don’t eat anything your great-grandmother wouldn't recognize as food. And, I would add, enjoy yourself while you’re eating it! 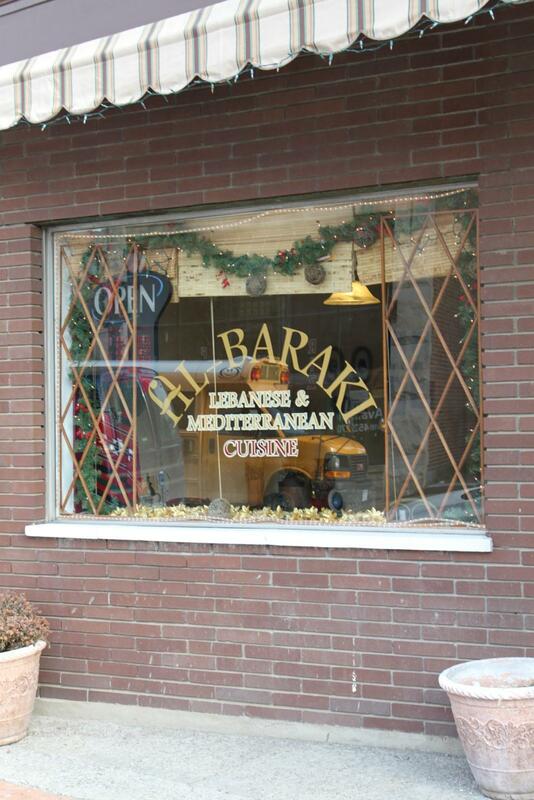 Try Al-Baraki; you'll like it. We eat a very healthy diet in our house: mostly lean meats, vegetables, some vegetarian meals, and few snacks. 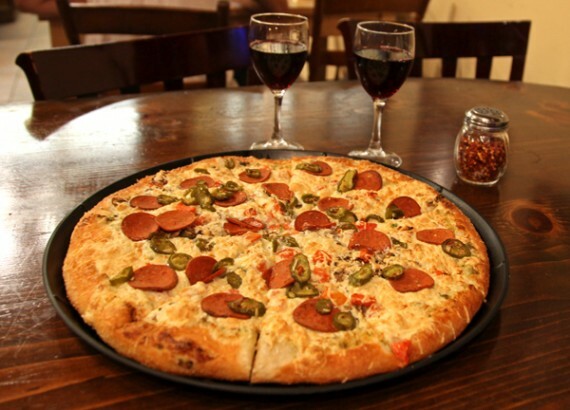 From time to time, being human after all, we get a craving for that all-American favorite: pizza. 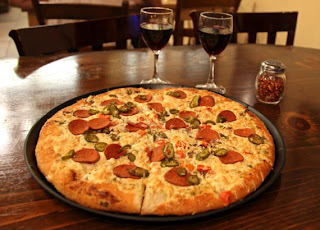 Since the restaurant chains we’ve tried seem to offer varieties which we find too salty and greasy, often overdoing it on cheese, making our own pizza suits us just fine. You can really get creative, too, in the version you make at home—which I hope this posting will encourage you to do. The first thing to decide on is the type of crust you want to have. 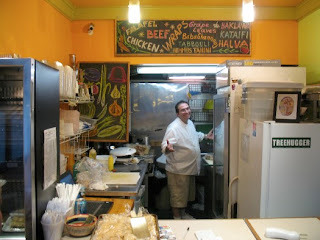 I know that there are many options out there, including packaged mixes and pre-made, ready-to-use crust. If I’m feeling lazy, I go to the supermarket or the bakery and pick up a bag of frozen dough, which naturally has to thaw before use. 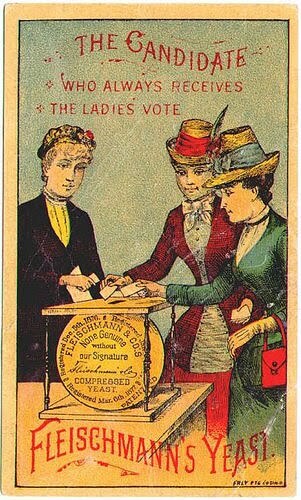 But it really isn’t difficult to make your own, though it is time-consuming. Here is a recipe for a delicious, homemade pizza crust that I’ve had for years. Dissolve a teaspoon of sugar and one package of instant yeast in one cup of lukewarm water. (The trick here is that the water cannot be cold, but cannot be hot or else it will kill the yeast.) Let the mixture sit for about 10 minutes; it should have grown considerably in volume by that time or else you may think of starting over. Then add in 2 tablespoons of olive oil, ½ teaspoon of salt, and 2 cups of flour. Gradually incorporate another cup and a half of flour, then put the mixture into a bowl which has a tablespoon or so of oil in it, turning the dough so that it’s coated with the oil on all sides. Now cover the bowl with a dishtowel and let the dough rise for about 2 hours. Often, in winter at least, I place the bowl in a 200 degree oven (which has been turned off) so that the dough has a warm place to double in size. When the time is up, punch the dough down with your fist and start stretching it to fit the size of your pizza pan; there is no need to throw the dough up in the air, but please try it if you’re feeling extra-confident that day. (You could also cover the bottom of the pan with cornmeal, if you want.) I usually cook the dough at 425 degrees for 5 or 6 minutes before adding the sauce and toppings. Sauces for the pizza can be varied to suit your mood. Recently, I sliced some fresh garlic (2 or 3 cloves) into a couple of tablespoons of olive oil and let it sit for a half-hour or so before slathering it on the partially cooked dough. This was great topped with goat cheese and grilled red peppers and onions. 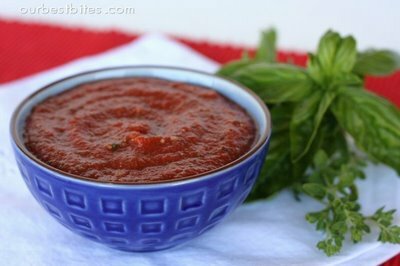 A quick red sauce that I regularly make starts with a can of tomato paste. I doctor it up with minced herbs, garlic, and parmesan, and dilute it to the desired consistency with chicken broth. You can then put the sauce, grated mozzarella and parmesan, as well as your favorite toppings onto the crust. The pizza then goes back into the oven for another ten minutes or so before it’s done. 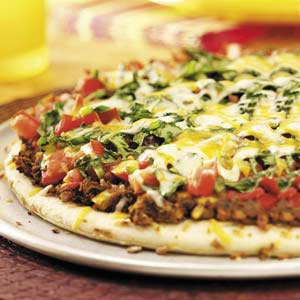 Years ago, on a trip to The Purple Pub in nearby Watervliet, our family tried their Mexican Pizza. Ever since, I’ve been making my version of this very tasty cross-cultural meal. I use a cup or so of Mexican salsa as the sauce and cheddar cheese. I brown about a ½ pound of ground beef for the topping, adding in sliced green onions, sliced black olives, chopped jalapeños, as well as cumin and chili powder to taste. This, according to my husband, is the best homemade pizza ever! If you like Mexican food, you just might agree!